Here we go with another rhubarb recipe! This one involves the easiest pastry dough ever, and is perfect for when you don't quite feel like committing to an entire pie. It's quick, it's easy, and it's delicious. 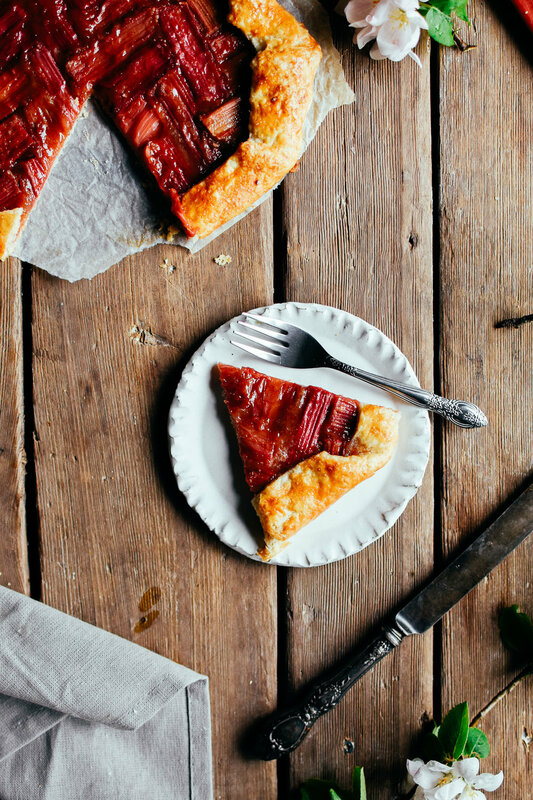 We're talking about a rhubarb galette! Simply make the dough, chill for an hour while you get the rhubarb filling ready and preheat the oven, and then put it all together. I chose to make a fancy pattern on top, but it tastes the same whether you do that, or simply dice the rhubarb. Galettes are so perfect for those long, warm summer nights, and I look forward to eating many while sitting on my patio! In a medium bowl, stir together flour, baking powder, salt, and brown sugar. Add cubed, cold butter, and cut into small pieces using a pastry cutter, or simply a fork. The pieces of butter should be about the size of a pea once you're done. Note: Another method that works well is to freeze your butter first, and then simply use a cheese grater to grate it into the flour mixture. Both methods work well. In a liquid measuring cup, add 2 teaspoons of white vinegar, and then top with very cold water until it reaches the 1/4 cup mark. Pour water over the flour mixure, and stir together. Lightly flour your work surface, and dump pastry dough onto it. Carefully work the dough with your hands until it just comes together, but there are no blobs of flour anywhere. We don't want to overmix here, or melt or butter by touching it too much with warm hands. Form the dough into a flat, round disc shape, a couple inches tall, and wrap in plastic wrap. Place in the fridge and allow to cool for at least half an hour, and up to a week. While dough is chilling, slice rhubarb into 1.5 inches pieces. The goal is for them to have similar lengths, widths, and depths, so I trimmed mine accordingly. If you don't want to make the pattern I did, simply dice rhubarb into half inch cubes. Toss rhubarb with sugar, cinnamon, and flour mixture. Remove dough from fridge, remove plastic wrap, and place onto a lightly floured surface. Roll out the dough into a circle until it's about 1/8 of an inch thick. You can trim the dough into a perfect circle if you'd like, or leave as is for a more rustic look. Alternatively, you may split the dough in two or three before rolling out for several smaller galettes. For rhubarb pattern: separate rhubarb from sugar mixture, and sprinkle the sugar mixture onto the bottom of the galette, be sure to leave 1-2 inches clear from the edge where you'll be folding the dough over. Start placing rhubarb onto the galette. I started from the middle, and placed rhubarb at right angles to each other, creating an arrow pattern. Hard to explain, but experiment with it and see the photos above. 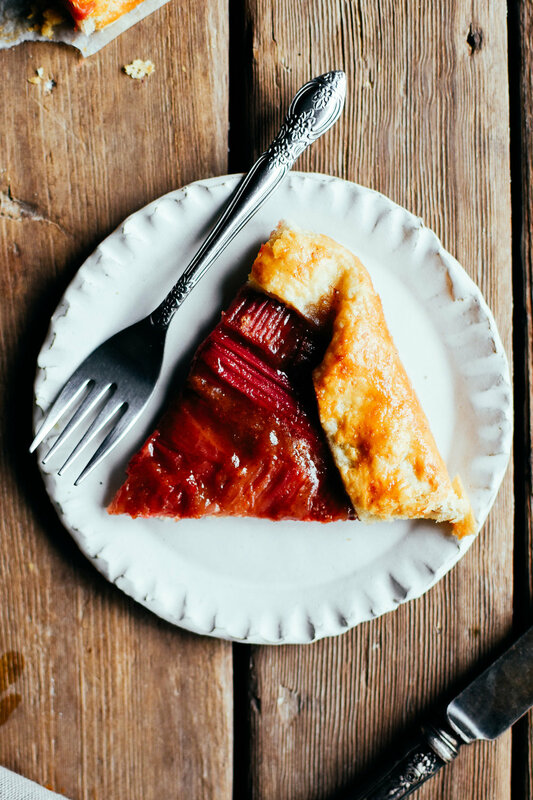 For a simple galette, dump the rhubarb and sugar mixture onto the middle of the pastry dough, leaving 1-2 inches of space around the edge for folding. Fill a tiny bowl with water to use for helping the dough stick together. Fold a section of the dough up over the rhubarb, it should be a few inches long. Carefully fold the section next to it over, and wet two fingers and wet the pastry where it has folded over, and gently press together. This keeps the galette from coming unfolded. Repeat folds all around the dough. Place in the fridge for 15-30 minutes before baking. This helps to ensure that the butter in the dough is nice and cold, which is what gives you that nice flaky crust! Remove galette from the fridge, brush the pastry dough with a beaten egg using a pastry brush, and sprinkle with coarse sugar to give it an extra sparkle. Bake at 400 degrees F, for 15-25 minutes, until crust is evenly golden, and rhubarb has started to bubble. Remove from oven, allow to cool for a few minutes, and serve. *Best served the same day, but will keep for several days.